If American Bedding had a mother, it would be Jan Reynolds. Not only does Jan work hard to "keep the lights on" as her daughter Hali likes to say, but she's been a steady, incremental part of the team since the very beginning. If she's not filing papers in the Accounts Payable department, Jan is probably spending quality time with her family. Here's an introduction to another one of American Bedding's loyal and beloved team members. You now work in the Accounts Payable department, but how has your work changed leading up to that? Oh my! When we started the business 21 years ago, I had three very young children at home and was a stay-at-home Mom. The kids and I came in to the office a couple of times a week to write a few checks; now I write hundreds of checks every month! Another of my responsibilities (everyone’s favorite) is writing payroll checks on Friday. The first few weeks back in 1997, I sat down with the IRS deductions booklet and calculated everything by hand. Boy, am I glad I don’t do that now with over 30 employees! 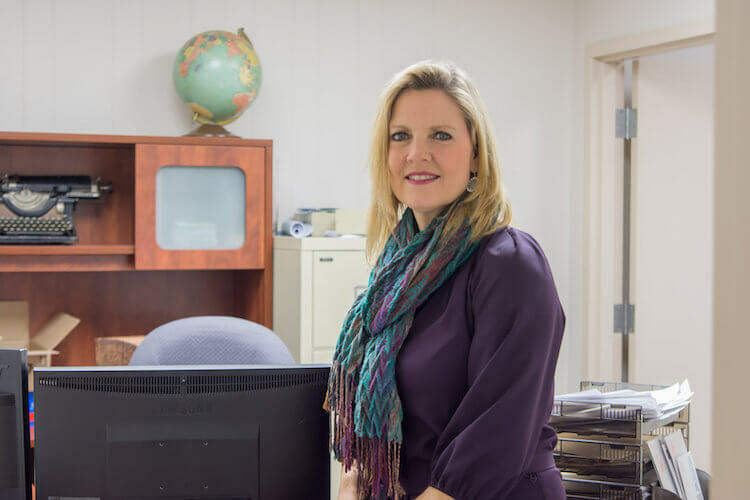 As personnel has changed at American Bedding, my roles have always changed. In October 2002, our salesman suddenly resigned and I immediately became the new salesperson. My children were all in school by then and I began to work more hours. Then in the fall of 2003, our Accounting clerk resigned, and I took over all of the Accounting responsibilities — that’s when we brought Tim Will in to replace me in sales. The one job that was the most difficult for me to do, as a Mom, was the shipping paperwork. That requires someone to be here everyday to get the bill of ladings typed out (back then it was hand-written). That’s when Joy Muir came alongside to do shipping. That freed me up a bit and provided more flexibility for me to be home when my children were home. The last major change in my responsibilities came in 2015 when Hali Reynolds joined the team. She took over the Accounts Receivable (along with countless other of her own jobs). That, again, freed me up to help with my grandchildren. When, how and why did you join the team at American Bedding? What is it like working at a company that's family-owned and operated? We are having the time of our lives seeing our grown children love the business as much as we do. It’s only natural for them because it’s been such a part of our lives from their earliest memories — dinner discussions were often business-related; in our very first building, we had a momma cat deliver a litter of kittens that we dragged home; and more than a few mattresses left this facility with little black footprints (from the fork truck dust) hidden away under the mattress cover. I think all of our children learned their alphabet by filing away my papers, and I can’t count the number of pizza nights we’ve had at the office over the years! One of our very first big orders was for 6000 Red Cross mattresses — our children were 3, 5, and 8 — plenty old enough to stick the Red Cross sticker on several thousand of those! Now the grandbaby rides the mattresses down the conveyor belt and has already had several office pizza parties! I think it’s about time for her to learn how to file my papers! What are your biggest day-to-day challenges at American Bedding? My biggest challenges have always been balancing family and work. I do not work full-time at American Bedding — never have. I was always a Mom first. So that means that sometimes I would put the kids to bed, then go in to the office and finish paperwork. It also means that my desk is usually horrendous because I have somewhere to be before I can get it straightened up. What are the best parts about what you do? Just getting to see the people here — my family and my "work family”. I’m not here as much as I’d like to be sometimes, but I love catching up with everyone when I pop in. I already mentioned how important my family is to me. When I’m not at work, I’m usually with some of them, or getting some of my home chores done so I can go be with some of them. We enjoy going to the lake, snow-skiing a couple of times a year, and romping around on our farm. God has also given me some musical talents, and I use those to help at the Christian school that all of our children attended, teaching handbells. Trusting Christ as my Savior at the age of 26 was the most important decision of my life. I'm not always successful in doing it, but striving to make Jesus look good is the most important thing in my life. The great people at our company are responsible for the great products we sell. Contact us today with your product questions!